Dorchester, MA (April 29, 2016) – A group of young residents of Blue Elm United Estates – an apartment community located on Seaver Street in Dorchester featuring 285 residences – recently celebrated the conclusion of the property’s second annual DJ program with a pizza party and music. With the help of instructor Jason Parreira, the youngsters, ages 7 – 16, learned the basics of mixing, blending and “scratching” many genres of music, going back to the 1980s. 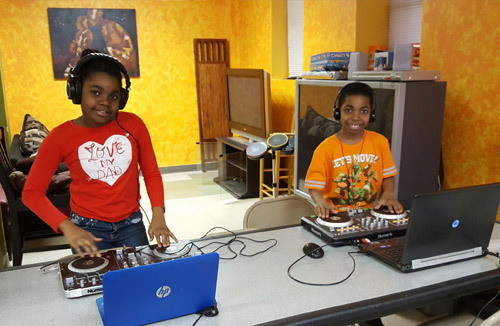 Participants in the six week class used CD players, turntables, mixers, controllers and DJ software programs to create their own versions of music hits. The program was funded by a Youth Resident Activities Program grant from MassHousing, which provides educational, employment, and recreational activities to young residents of MassHousing-financed properties. Blue Elm United Estates is managed by full-service real estate firm, Peabody Properties, Inc.
Pictured above (left to right): Angie Edouard (10) with her brother, Ernest Edouard (7) trying out the turntables during the DJ program.